I fell in love with Stephen Collucci's Glazed Filled, Sugared & Dipped the moment I realized it had an actual donut hole in the cover. Seriously. There's a hole in the cover that peeks onto the next page. Like a children's book. But better because it's about donuts. Now that is seriously clever. Whoever had that idea deserves a raise because I'm officially obsessed with it. I can't stop turning the page and giggling. You can see the donut "hole" on the left side! 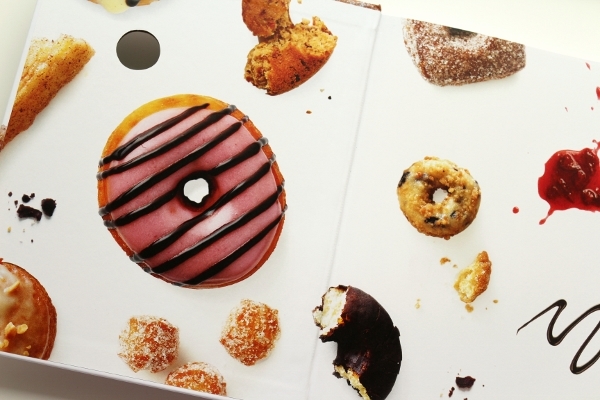 This is the inside of the cover... great donut photos! Now I know they say "don't judge a book by its cover." Well, I'm judging and I'm loving, but I do realize that "it's what's inside that counts," and so I decided to look deeper than just the awesome cover when I received a review copy of this book from Clarkson Potter. I was pleased to see a really simple and streamlined approach to donut-making, with very clear instructions and tips on cutting, deep-frying, etc. 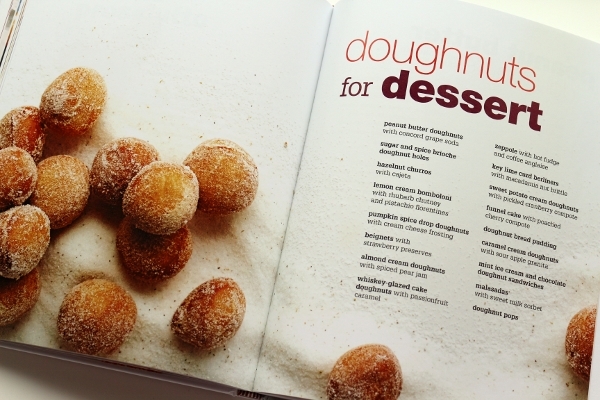 The book begins with two basic donut recipes: Basic Cake Doughnuts and Basic Berliners (aka yeast or raised donuts). 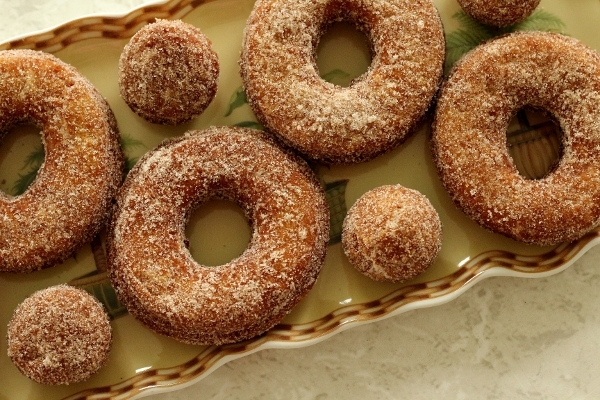 It is then divided into Doughnuts for Breakfast, Doughnuts for Dessert, Fillings, Glazes and Sugars, and Accompaniments. Realistically, those first two chapters can easily create donuts that can play in either breakfast or dessert categories. 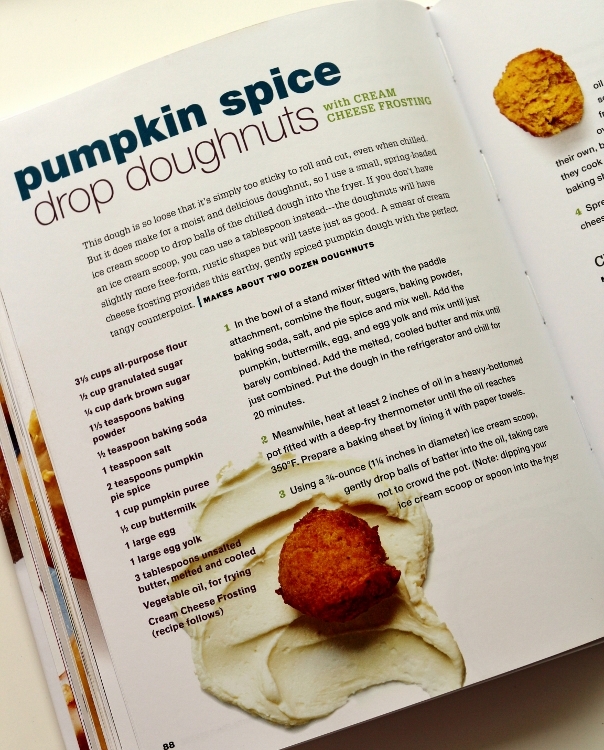 I love that each of the recipes includes a suggested dipping sauce or accompaniment, which really allows you to dress up your donuts more if you'd like, although the donuts themselves are fantastic on their own. Eleven recipes in the book utilize the Berliner dough, which is great because there are so many unique recipes for embellishing them, such as Banana Cream Doughnuts with Peanut Butter Mousse and Sweet Potato Cream Doughnuts with Pickled Cranberry Compote. 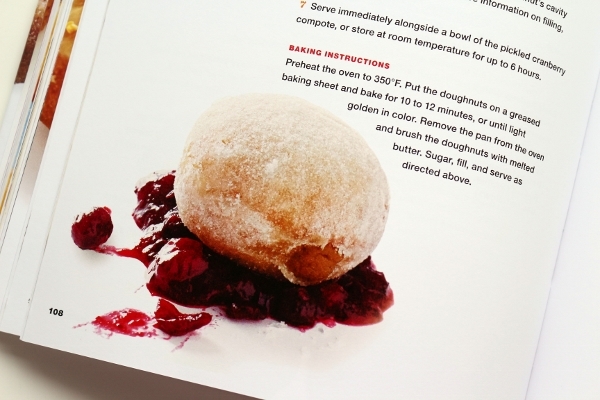 The Berliner recipes also have you proof the dough only once, not a second time after they are cut. This may stray from other yeast donut recipes, but I have been assured that this is correct. Sweet. That's even less time between you and your finished donuts. 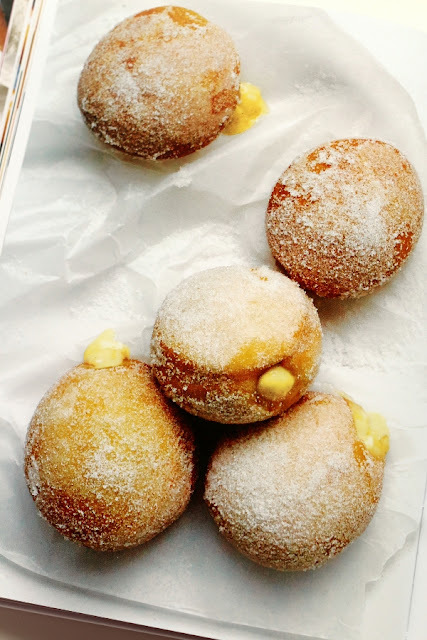 Additionally, I think it's important to note that nearly all of the yeast-based donuts, from Berliners to Beignets, offer additional instructions for baking them if you desire. 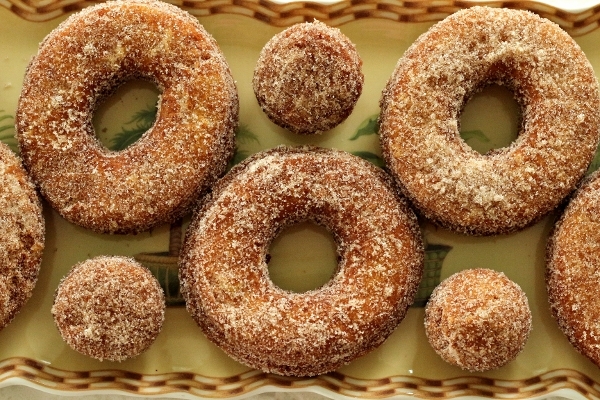 I fully realize that baked donuts are not quite in the same camp as fried ones, but for those of us looking to indulge with a bit less guilt, I'm very pleased to find these extra steps. 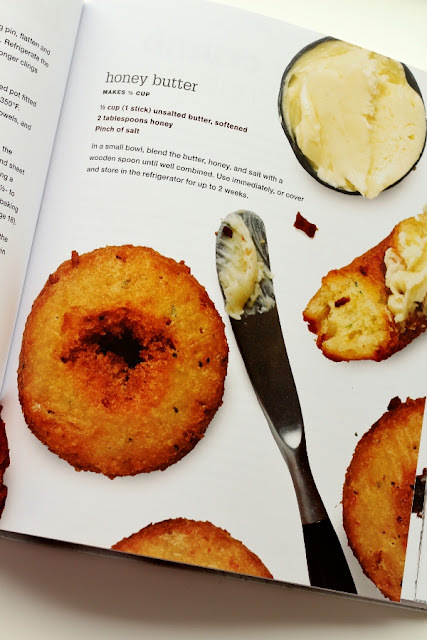 I contacted the publisher to get some comments on how the texture would be different for baked versions, and was told they would be a little more dense and a little less crispy, with a softer skin, much like that of a sweet/dinner roll, on the exterior. Good to know! 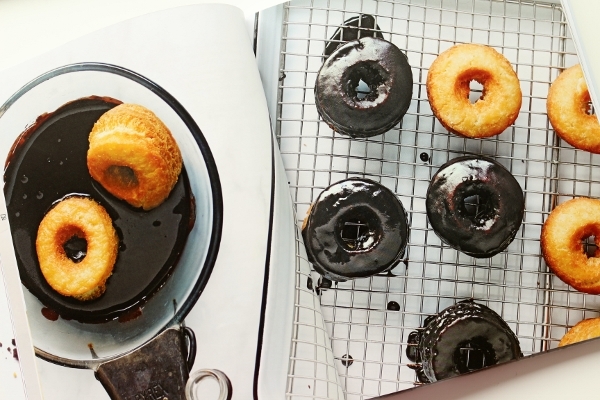 There are also 4 recipes in the book using a donut pan to bake cake donuts. With creative varieties such as Gingerbread Doughnuts with Gingerbread Glaze and Date and Prosciutto Doughnuts, these are just as exciting to try as their full-fledged fried cousins. There are some great International donut recipes in the book as well, such as Hazelnut Churros with Cajeta, French Crullers with Apple Butter, and Zeppole with Hot Fudge and Coffee Anglaise, just to name a few. I really love the photos in the book and how they are woven right into the recipes. It's very natural and a nice alternative to simple pages of photos. 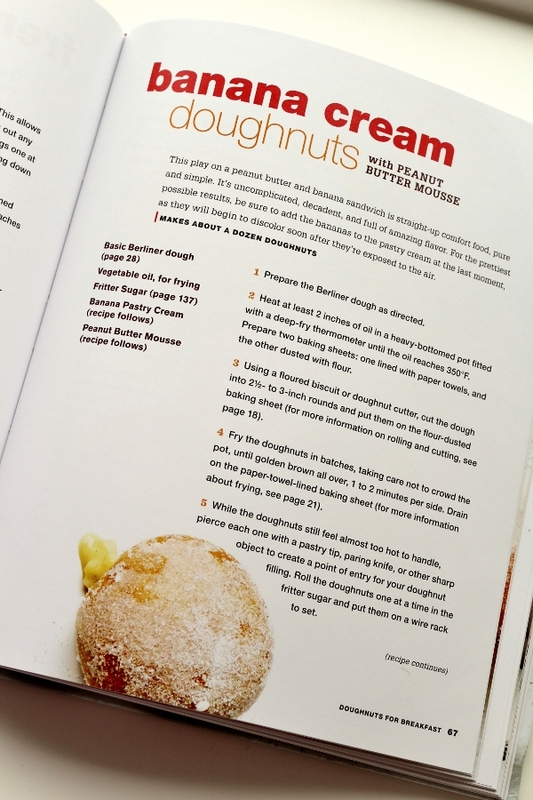 It adds bursts of color to every page, and offers various looks at the same donuts in different stages (sometimes half eaten) since there are photos that cover more than one page of each donut's recipe. I always find it difficult to select the first recipe to try out from each cookbook I review, and this was certainly no exception. I was very tempted to try the Beignets after enjoying them for breakfast during my recent birthday trip to Disney World. 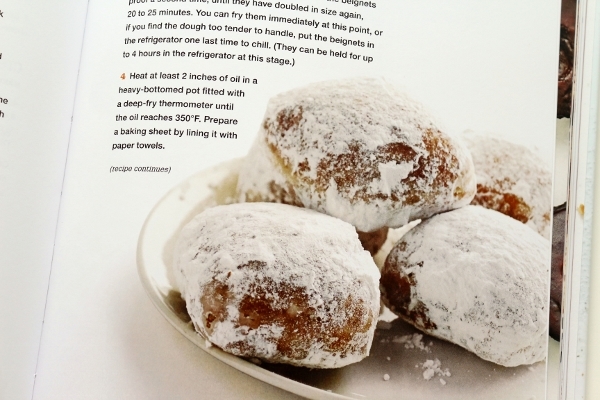 I also desperately want to try my hand at jelly donuts, stuffed with homemade jam I made this summer. Don't even get me started on all the various cream-filled Berliners, from coconut to sweet potato. 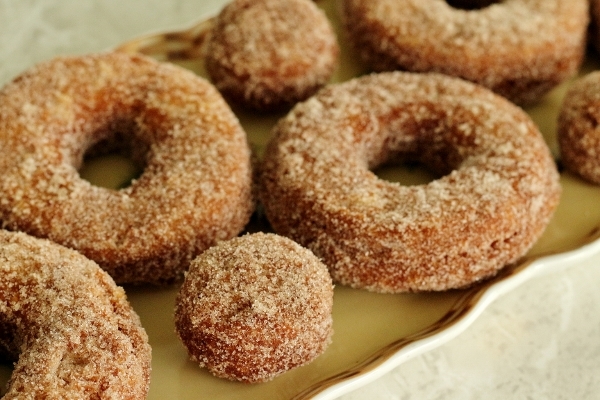 In the end, I picked the most appropriate donut I could have to celebrate the start of September: Apple Cider Doughnuts. 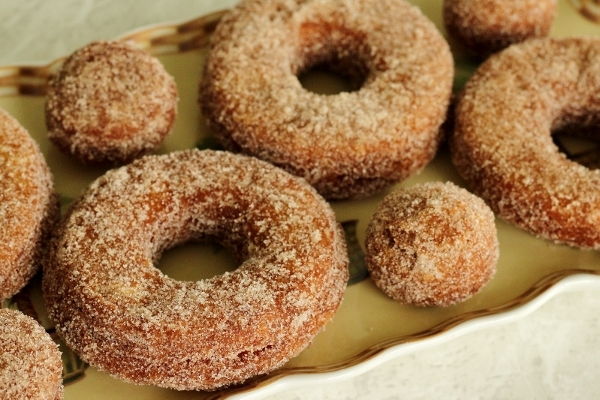 The recipe pairs them with a Butterscotch dipping sauce, but I simply made the donuts. This was my first attempt ever at making donuts, and I must say it was easier than I could have imagined. And the results... phenomenal. The dough came together very quickly in my stand mixer and was easily rolled out between sheets of parchment before chilling. The most difficult part of the entire process was waiting for the dough to chill enough so I could cut out the donuts and fry them! Man, that part was excruciating! I was so impatient. For me it took over an hour to chill properly, and then moments later I had cut out exactly 7 donuts using my 3-inch cutter with 1 1/2-inch holes in the center, and 15 donut holes (both from the actual holes and the scraps of leftover dough). Once in the fryer, the pale rounds of dough turned golden almost instantly, and before long they were tossed in a lightly salted cinnamon sugar (the salt adds a lovely touch I never expected!) and went directly into my mouth. Oh Heavens. They are SO. GOOD. I have never had such melt-in-your-mouth-tender donuts in my life. MY LIFE! 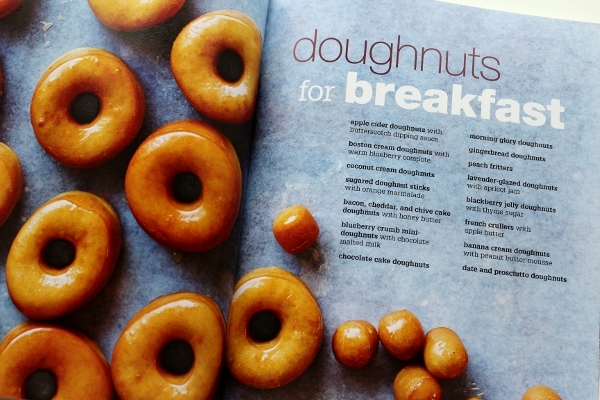 If every donut in this book tastes as good as these do, then I better hit the gym ASAP because I'm in major trouble. This book is worth your money and all the extra calories it will add to your diet. Indulge. I promise, you'll never look at donuts the same way again. To make the cinnamon sugar: whisk together all the ingredients. Use immediately, or store in an airtight container for up to 2 weeks. 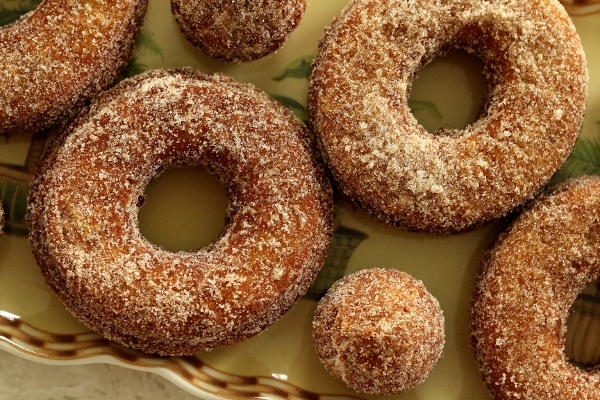 To make the doughnuts: boil the cider in a small saucepan for about 5 minutes, letting it bubble away until reduced to a syrupy 2 tablespoons. Set aside to cool. Meanwhile, in the bowl of a stand mixer fitted with the paddle attachment, cream together the butter and sugar. Drop in the egg and mix well, and then add the flour, baking powder, baking soda, cinnamon, nutmeg, and salt (I recommend mixing the dry ingredients first in another bowl and then adding them so the ingredients are evenly distributed without over-mixing the dough). Mix until just combined, scraping down the sides of the bowl with a spatula every so often. Drizzle in the reduced cider and the buttermilk, and mix until just combined. The dough should hold together, but still be on the sticky side. Scrape the dough onto a sheet of parchment paper and put another sheet of paper on top. Using a rolling pin, flatten and roll the dough until it's 3/8 to 1/2-inch thick. Put the dough in the refrigerator and chill for 30 minutes to 1 hour, until it no longer clings when you try to peel off the parchment paper (I chilled mine longer). Toss them in the cinnamon sugar while they are still warm.